Mac OS X Snow Leopard can be upgraded directly to OS X Mountain Lion, assuming the final release maintains the same capacity as the currently available developer previews. To perform the direct upgrade as it stands today, users will need to have created an OS X Mountain Lion USB installer from which to boot off of and upgrade with, though there is a possibility that a Snow Leopard Mac will also have access to Mountain Lion directly from the Mac App Store. We have received many questions about this in our inboxes and comments and figure with the OS X Mountain Lion release date set for summer it’s a good time to answer it based on currently available information. It’s important to note this upgrade path is based off of the current developer previews of Mountain Lion and upgrade eligibility could change before the public release, it’s also possible that Apple won’t officially support upgrading from Mac OS X 10.6 to 10.8 and this could remain an unofficial and unsupported feature. A fair amount of OS X Snow Leopard users have held off on upgrading to OS X Lion, but with the release of Mountain Lion around the corner it’s quite likely a lot of OS X 10.6.8 holdouts will jump directly to OS X 10.8 if it is possible. 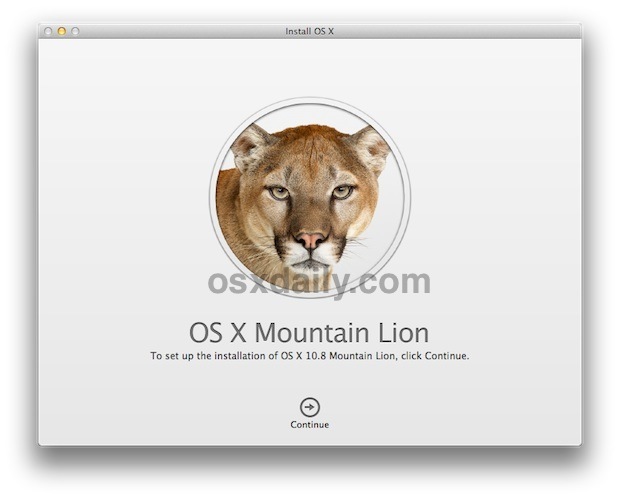 Mountain Lion does have stricter system requirements than it’s predecessor, however, and some owners of older Mac hardware could wind up with Lion being the last supported version of OS X on their machines. We will update with additional information on the various Mac upgrade paths to OS X Mountain Lion as further details become available. Hey just an FYI MacWorld seems to confirm this! I hope it is true because I have been using Snow Leopard on my Macbook Pro and wish to update to Mountain Lion. Yup. I went from OS X 10.6.8 to OS X 10.8 DP3 without incident on a test machine a few weeks ago. I would be surprised if Apple changed this. But what if I have a 4 year-old MacBook Pro? I have the understanding that I won’t be able to upgrade to Mountain Lion in any way. Can somebody confirm or deny this? You’ll have to wait and see. Core 2 Duo and up is probably good. Hello, i miss information about compatibility with older apps. On my macbook i migrated from tiger to snow leopard and not to lion just because of the issue that older apps which contain PPC code will not be run on Lion. Grrr. On my i5 Mac mini with Lion these programs are consequently refused. I need them for music etc so i want to know whether to run or not to run them. Is Mountain Lion available now (July 8, 2012)? Will I loose my Family Tree Maker 2010 version 19.2.1.241? Both of my USB ports have stopped working (I use with mouse and flash drives). Will this make them work again? On the latter, I tried software updates, hardware test, SMC, Pram, battery reset, new user account. (The USB appear in System Preference)….I’m at lost on this! I currently have MacBook Pro 2011 10.6.8 ….so this is the Snow Leopard, as I understand, and you are saying I could upgrade to the best available, which is “Mountain Lion” 10.8, correct? I have a white macbook that has a Intel Core 2 Duo processor. I’m currently running leopard and the laptop is a 2008. I know I can upgrade to snow leopard and will shortly but can i upgrade to mountain lion? The apple website says it requires a 13 inch aluminum 2008 macbook or a 2009 and later. I believe my laptop has the same features as an aluminum 2008 because my dad has one and our processors are the same. silly Mission Control vs the more efficient Expose/Spaces, etc etc. Apple please give us back some control, give us back some OS X in this iOS mess.